Lens treatments can dramatically enhance the quality of vision and the durability of lenses, and lens treatments can assist in protecting the eyes. The following lens treatments are aimed at giving eyeglass wearers an overview of the most popular and most meaningful treatments available on the market today. There are many more lens treatments available at Rosin Eyecare than what is listed below, but our goal is to give you some good information as it relates the most common lens treatments. Contact us if you have specific questions about eyeglasses> and we’ll be happy to answer them. What? 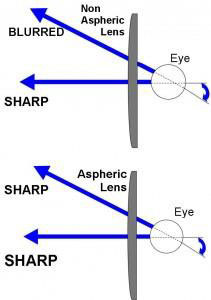 Aspheric lenses are not evenly shaped across there surface. Instead, they have varying degrees of curvature across their face. Why? To combat distortion at the edges of lenses and work with the way eyes naturally move to ensure clear, sharp vision over a greater range of eye motion. The other benefit of aspheric lenses is cosmetic. For example, if you are significantly near-sighted, these eyeglasses make your eyes will look noticeably smaller to those looking at them. Conversely, if you are significantly far-sighted, your eyes will look noticeably larger to those looking at them. In both cases, aspheric lenses help to make your eyes look more natural to those looking at them. What? Lenses that change color in response to UV light. 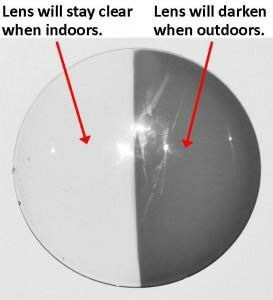 This darkens the lense when in the sun, and they remain clear in artificial or indoor light. Transitions lenses are a popular brand name of this type of lens. Why? For those who spend much time indoors but go outside on occasion, such as office workers on outdoor lunch breaks, these lenses offer a convenient no-fuss alternative to sunglasses. There’s no need to worry about having a separate pair of sunglasses in addition to your everyday glasses. A note of caution: because car windshields block UV radiation, these lenses will not afford sunglasses-like anti glare protection while driving. What? 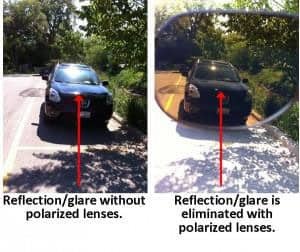 Polarized light can be any of the following: light reflected off flat surfaces such as water, ice on roadways, wet pavement, or even sun hot spots reflected off car rear windshields. When we see this type of excessive horizontal reflection (polarized light), we perceive this type of light as glare. Polarized lenses are specialized lenses that have a built in horizontal filter that eliminates this polarized light or glare from our vision. Why? Glare is hard for the eyes to deal with. Glare encountered when driving, for example, slows our ability to perceive objects and has been shown in studies to slow our reaction time. Eyeglasses with polarized lenses are recommended for daytime driving, water sports such as lake, ocean and fly fishing, as well as any activity where glare is regularly encountered. What? To understand what anti-reflective coating (or non-glare coating) is, you will need to understand some basic concepts of light. When light hits any surface, such as spectacle lenses, three things happen to that light. Some of the light is absorbed by the lens, some of the light is reflected by the lens and the majority of the light passes through the lens and is refracted. 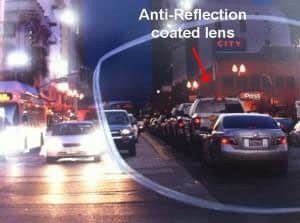 Anti-reflective coatings have been developed to increase the amount of light that passes through the lens by decreasing the portion of light that is either reflected off the lens or absorbed by the lens. Why? Anti-reflective coating allows more light to pass through the spectacle lenses so vision is improved in low light conditions such as driving at night. The coating also eliminates glare caused by light reflecting off the back or front side of the eyeglass lenses. Patients who have trouble driving at night due to glare caused by oncoming headlights, or have difficulty driving in snowy or rainy conditions, will benefit from this technology. There is also an additional cosmetic benefit. Since light is not reflected off the front surface of spectacle lenses with anti-reflective coating applied, people viewing you will not see a reflection and will be able to see right through your lenses as if they were invisible. This benefit is critical for patients who are in front of the camera, or on stage in front of an audience. What? The most common source of ultraviolet radiation is emitted from the sun. There are three types: UV-A, UV-B and UV-C. With prolonged exposure, these rays have been proven to not only damage skin and cause skin cancer but also damage the eyes. Research has shown a connection between UV exposure and conditions like cataracts, photokeratitis, macular degeneration, pterygia and more. Why? 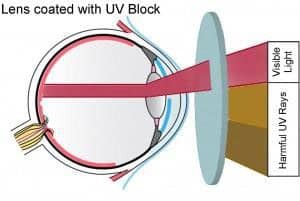 UV Block eliminates the ability of ultraviolet rays to pass through spectacle lenses and enter the eye. It is an important consideration for patients of all ages including kids. In fact, studies show that between 50% to 80% of our lifetime exposure to UV rays happens before the age of 18 due to the amount of time the average child spends outdoors without proper eye protection. All Rosin Eyecare spectacle lenses come standard with UV block. What? 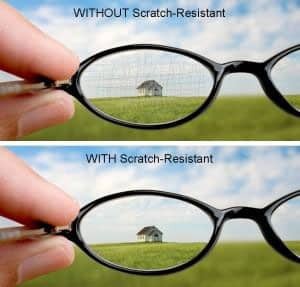 Scratch-Resistant Coating (SRC) is a very thin clear coating applied to optical lenses. This thin coating chemically adheres to the front and back surface of the lens. SRC greatly reduces the potential for lenses to scratch and those scratches may impair vision. Rosin Eyecare includes SRC in all lenses. While lenses with SRC applied are not scratchproof (in fact, no optical lens material is scratchproof) the coating prolongs lens life, impairing scratches from occurring. Why? SRC prolongs the useful life of lenses by eliminating scratches that would otherwise impair the users vision. Our studies indicate that a pair of lenses with both front and back side SRC applied will last 10 times longer than non-SRC lenses. 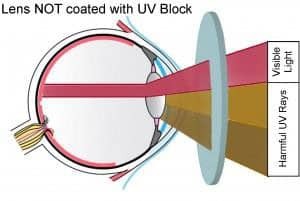 Our eye doctors feel so strongly about the benefits of this lens treatment that all our lenses have SRC applied to both the front and back side of the lenses.